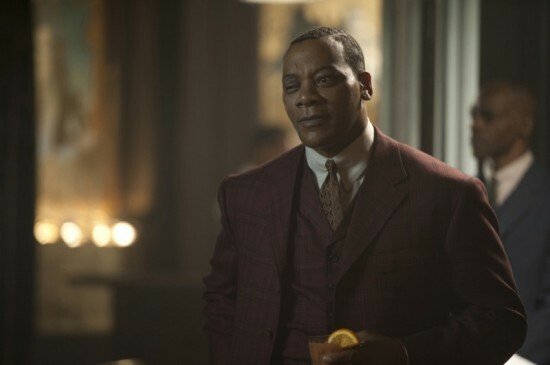 The Spin: Sally (Patricia Arquette) surprises Nucky by arriving in AC along with the first shipment of booze from Tampa, but Nucky is still too busy trying patch things up between Eli (Shea Whigham) and his son Willie (Ben Rosenfield). What he doesn’t realize, though, is that Agent Fox (Brian Geraghty) has been clued into the mysterious nature of Willie’s schoolmate’s death and how his roommate got charged with the murder. Thus he visits the poor kid in the slammer and gets the real scoop. This allows Fox to brazenly approach Eli with an ultimatum. But the really interesting action this evening was the Chalky vs. Narcisse plotline, which got even hotter and heavier. Following the murder of a deacon and pleas from the congregation, Chalky decides to clean up the heroin house Dunn Purnsley (Eric LaRay Harvey) has been helping Narcisse run, but of course Dunn pins it all on the other guy to keep his cover. Narcisse then uses Daughter Maitland (Margot Bingham) to keep Chalky in her chambers so Dunn can come over and finally reveal who he’s been working for. A serious scuffle ensues. Feeling guilty for setting up Chalky, Daughter shows her new allegiance by stabbing Dunn in the back to prevent him from choking old Chalky to death. Another hour, another regular (though justly so this time) bites the dust. Wait Until Next Week: Will the Chalky vs. Narcisse rivalry finally come to a head? What did Eli agree to do for Fox? And the previews make it look like things will get hotter and heavier out in Cicero. This entry was posted in Boardwalk Empire: Complete Episode Guide, Pop Culture, Television and tagged Atlantic City, Ben Rosenfield, Boardwalk Empire, Boardwalk Empire Blow by Blow Episode Guide, Brian Geraghty, Christine Chambers, Eric LaRay Harvey, Gangsters, HBO, Howard Korder, Jeffrey Wright, Margot Bingham, Michael K. Williams, Patricia Arquette, Prohibition, Shea Whigham, Steve Buscemi, Terence Winter, The 1920's, Tim Van Patten, TV Series. If Eli betrayed Nucky for a second time, I think he’s a dead man. This was one of the better episodes of the season. One would think – I tend to believe that father-son hug at the end of the hour may have been a goodbye to Willie. To the slammer!